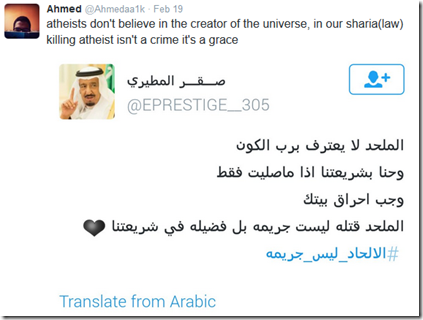 What’s Being Said About Atheists In Arabic? 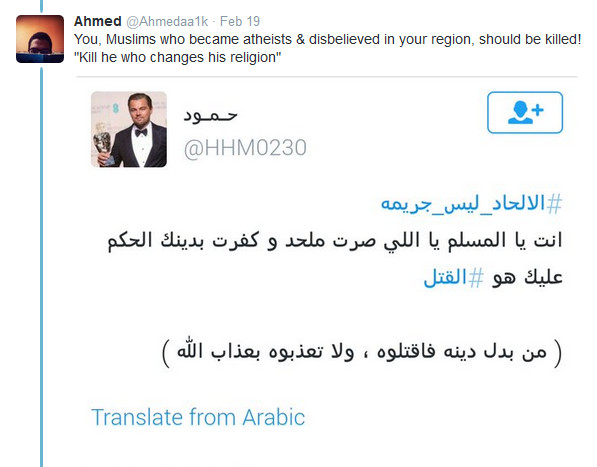 This was just a sample of the religion inspired lunacy Ahmed uncovered. Let this serve as a reminder to the secular, atheist wing of the regressive left: this is the mentality you’re providing cover for and your apologism will not save you from it. Silly boy, they’re just talking about peace. The reason True Believers have been killing each other over the tenets of their own religion for the last dozen-and-change centuries is Western imperialism and before that…you know…reasons. But beliefs don’t inform behaviour, no sir, not at all. That’s why it’s important for the well being of society that people hold them. Or something like that. Why were there so many tweets from the same guy? 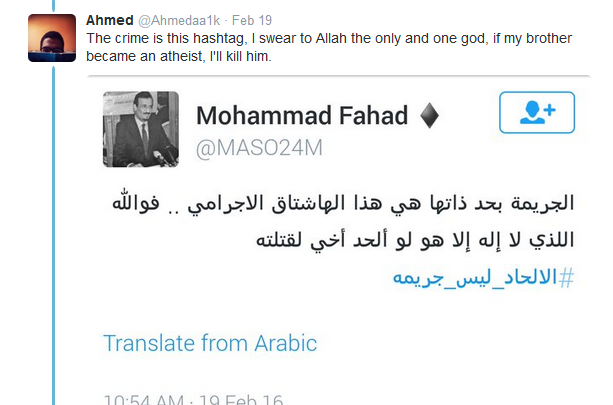 The original tweet was from Ahmed (atheism is not a crime). All the others were responses to his tweet. 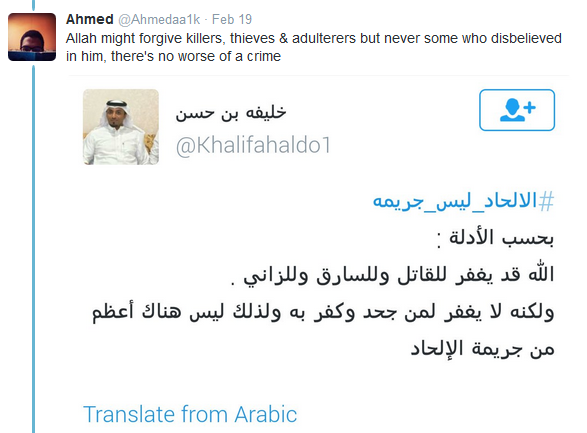 The reason they look like they were from him is because he translated them from Arabic to English and posted the translation. Ignore my last comment! This is depressing and discouraging to say the least. Oops, sorry Alex! Just saw this. 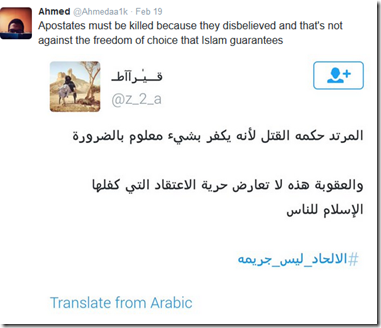 Yes, the “religion of peace” is specific about what should be done with apostates. I’ve no idea what has happened to lead people who ostensibly believe in liberty and equality to pile on in defense of these beliefs. It makes no sense. I think the key word in your post is “ostensibly”. 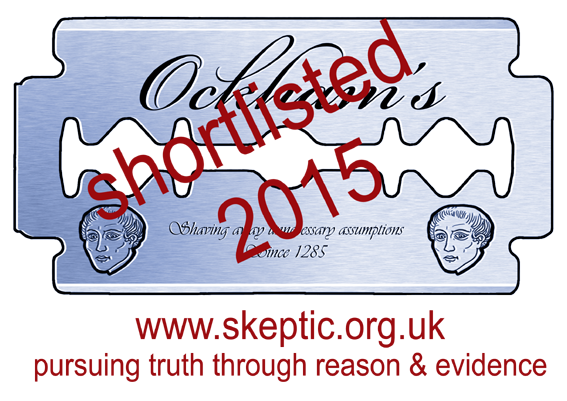 The reality is that most of the people you reference simply don’t really believe in the things they claim to. Their behavior trumps their rhetoric. They seem like friendly people, but only because it’s racist to think otherwise. What’s the racist part? Islam is a religion, not a race. I don’t see what you’re getting at. That was a joke about regressivethink. Islam: a religion enthusiastically looking out for insults that need look no further than …. a mirror. What is striking to me is that many/most of these tweets are made by people who appear to have genuine photos of themselves attached to their account. They appear to have no desire to remain anonymous. I announced your post on my blog because I think it deserves broad exposure. 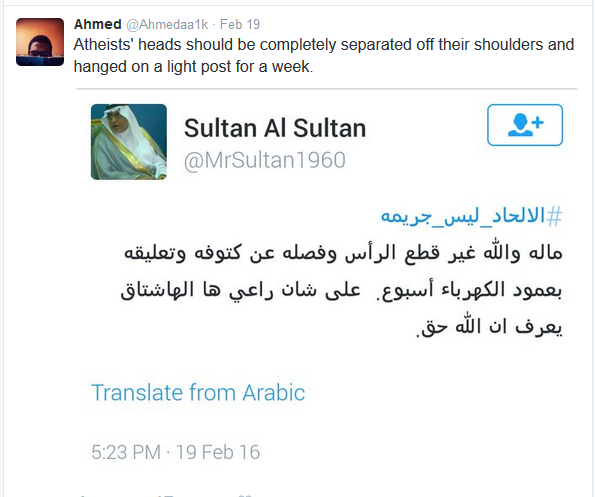 I’m curious if any Muslims on Twitter criticized the people who announced their desire to torture and/or execute atheists? 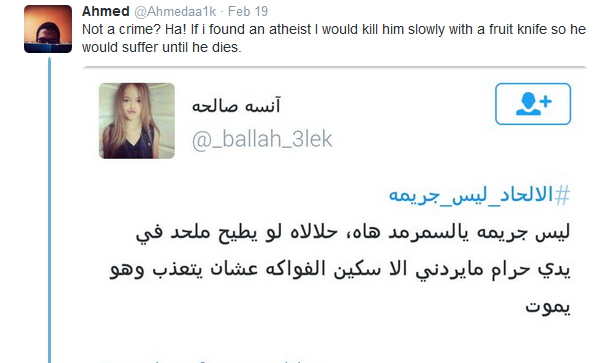 Because in that religion, they’re all still free to advocate death to atheists. Christianists believe the same thing, but don’t want to admit it, though most still do. Ugh…this is like lifting a stone and seeing what crawls underneath. I really hope, probably against reason, that these views are not widespread. How many generations will it take for such views to disappear? Very sad. 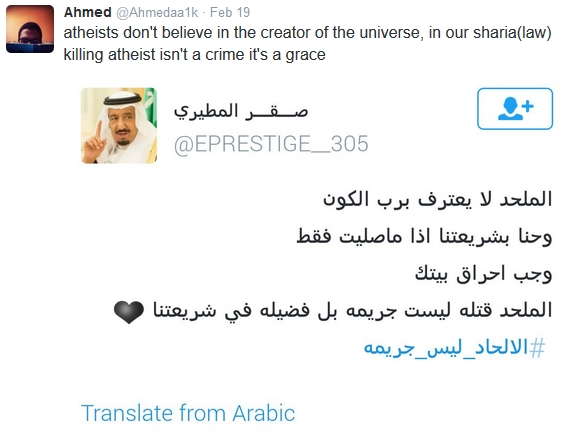 Since there is such a small sample I doubt my of these tweets are from atheists, but it is inevitable that would be the case with a large enough group. If we assume these tweets to be from KSA we should assume these statements to be what they are expected to say in these societies, not an accurate reflection of real belief, but espousing expected beliefs. This is just one pernicious effect of a theocratic state. Hei! these people should have some good reading! Like Silverman’s “Fighting God” … yeah, I remember now… they can only read ONE book! I would echo the same question Jefferey asked: “I’m curious if any Muslims on Twitter criticized the people who announced their desire to torture and/or execute atheists?” Because you’ll find Westerners saying some messed up stuff on Twitter too (look no further than Donald Trump), but you’ll also find a lot of people calling them out for it. If the latter part is not happening in Arabic (and I have a sinking feeling it’s not), then there’s a real problem. But I want to bend over backward to be fair and make sure we’re not just cherry-picking the Muslim equivalent of a Trump rally here. Is that your kid in the profile pic? Unbelievably cute and adorable! Peace be upon you my friend. There are. But people rarely use twitter in my opinion. I dont. You can find a lot of people calling out these idiots on facebook if you care to look..
Should we not be comparing and contrasting these religious words with other religions. What do fundamentalist Christians or Jews say about athiests? etc.etc. The “regressive” left should not be held accountable for trying to offer equality to all. That is the rationale I see the “regressive” left is using in trying to provide a equalized environment for even these repressed Muslims who may feel obligated (as others upthread have mentioned) to spew the EXPECTED Islamic rebuttal to atheism. Who knows what would truly happen if these people were to be allowed to freely move about in an open and welcoming society. Repression is inhumane on so many fronts they are uncountable. If after being allowed to live in an open society these Muslims ACT on these thoughts, then they should be dealt with accordingly. 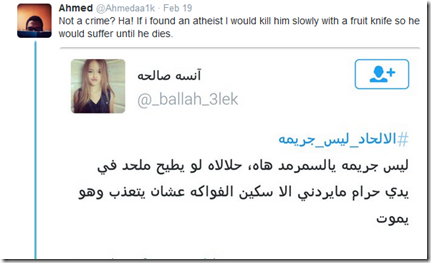 But, you have no idea as an atheist what I would do to those who practice religion. It is our actions that matter. 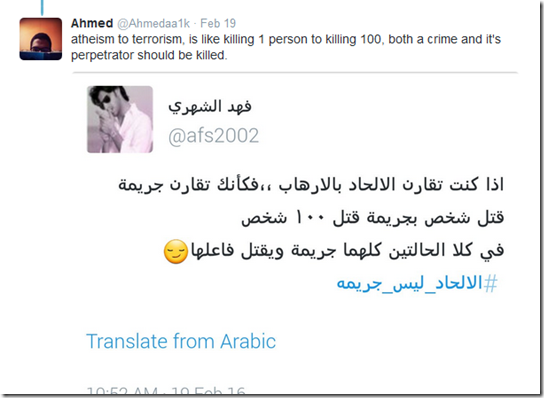 Big difference between Islam and other ideologies of which Christianity. Christianity does not claim the Bible as the perfect word of God. The Bible is a collection of narrations transmitted by different guys. There is an historical context also and most atrocities apply to areas where barbaric deeds were occurring such as human sacrifice, child sacrifice, debauchery, perversion, mischief… No mention that atrocities are God’s orders. The Holy Qur’an is the perfect word of their God, transmitted by one single individual who happens to be the perfect individual. Their God speaks through their Holy Qur’an, these are his orders. 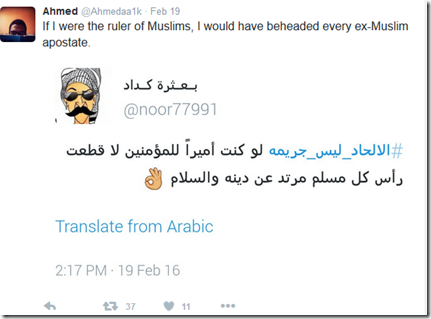 As to context – until Islam reigns supreme. I think God in the Old Testament was just as full of hateful bile. He ordered Abraham to sacrifice his son, destroyed a city of gay people and was generally a petulant psychopath. Reformation is the key. The other two went through it, and so have finally chilled. No chilling with Islam, and that’s what has become naked to everyone. Not Reformation. 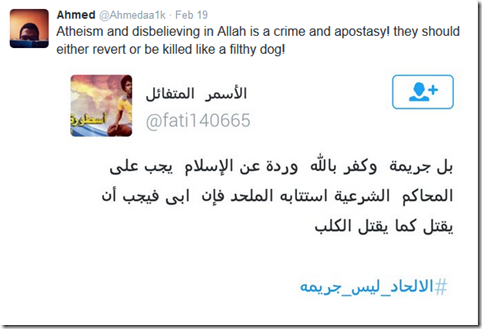 Islam has had it’s reformation – that is what Salafism is all about. Reformation in the Christian world produced the bible reading literalists of the protestant movement who wanted to reach back to what they considered the “authentic” Christianity. In ISIS we have the same impulse in an Islamic context. 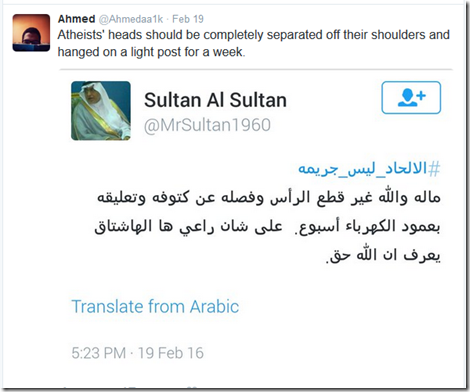 What the Islamic world needs is an Enlightenment. Screw the Reformation – that’s just playing in the same sandpit. Kick the castle over with an Enlightment. No, we should not be changing the subject by comparing to other religions. Everytime somebody criticises the doctrine of Islam, somebody else cries “but what about Christianity! ?’ and derails the conversation. 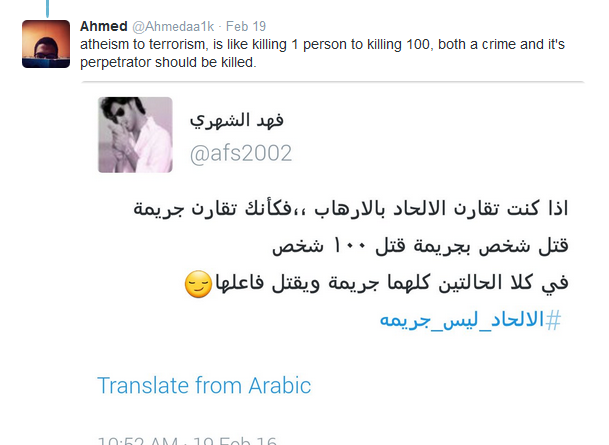 This is pure hate: they want to kill people they don’t know because they think differently. Hate is the prime modus operandi of religions: hate those who disagree with the myths as they are dangerous: they can make you see the truth and leave the religion. To seek the truth you need doubt, otherwise you’ll believe all lies. Religions are based on faith, which is the absence of doubt. Religious people hate those who doubt as they cannot be converted, they are taught to hate and ultimately to kill them. the religion of peace? i think not. I don’t agree at all with what Ahmed said but Steven Knight…you could’ve at least used 1 other person besides Ahmed. Perhaps reread the very first paragraph again. Are you saying Ahmed’s translations are inaccurate, or do you (mistakenly) believe he was the one who made all these comments? If his translations are inaccurate, you’re welcome to provide us with corrections. If you think he made these hateful comments, pay closer attention. Weird that critics of Islam are censored and entire accounts closed yet calls for violence by Muslims are deemed acceptable. 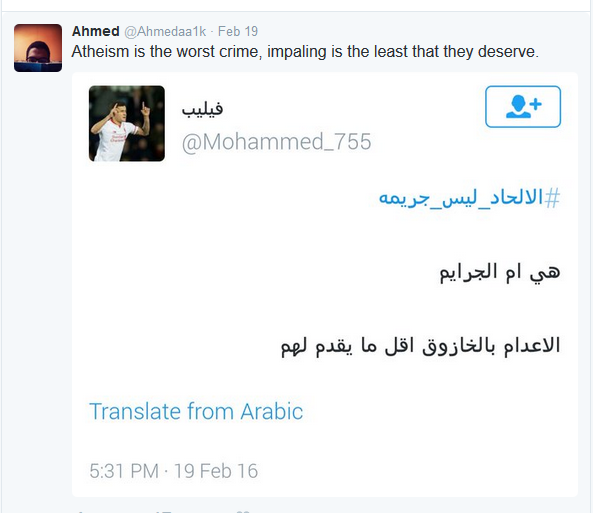 The same ignorance as all religions, just more violent. 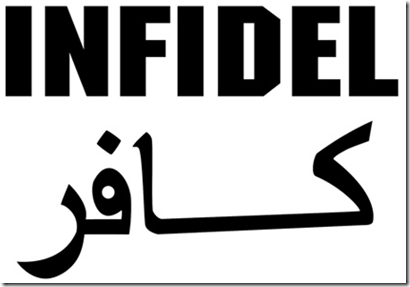 No, fools, I don’t reject Allah, he’s just a character in a story you believe, I reject you. Just like if you told me you believed in Leprechauns, I would reject you as a weirdo, not Leprechauns, they don’t exist. It’s like if you gave a monkey language, but no more intellect! …That said, I hope this is not a good representation and maybe just the comments from a site of radicals. I know there are a few Christian sites like that. Many a fairy tales have caused the senseless killing of people. I have yet to see the day a child was molested, a man beheaded or a Socialist crucified in the name of Charles Darwin. Silly Adults imaginary friends are for kids!!! The Arab world has many lovely people in it, as do all the other countries on this planet. There are ignorant morons everywhere. What is important is freedom of speech and a secular education–that way people get to communicate with common ideas and values. 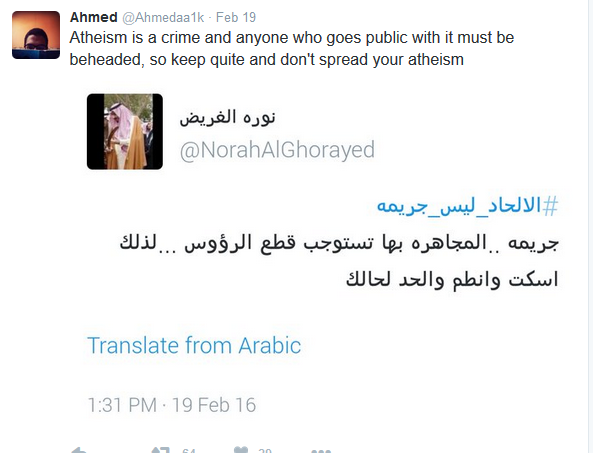 Unfortunately, freedom of speech and a secular education are not a possibility in the vast majority of the Arab world. Those lovely people you speak of are individuals, and you can find decent individuals anywhere; my contention is that these individuals are not at all representative of the culture or societal norms in the Arab world. 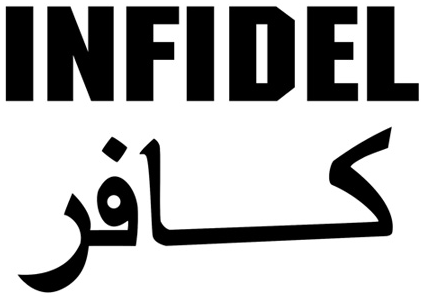 Most Westerners’ experience of the Arab world the is filtered through the media, social media, or limited personal accounts. Of course, we also have our own perceptions, biases, and ideal realities that we wish to be true; these all play a role in shaping our perspectives on what the Arab world is like. What is often overlooked is that in the media, you would find extremes: conservative Arabs/Muslims or very liberal ones, and both sides often live in the West who either have no direct experience in Arab countries or have forgotten what it was like living there. These cases are not a representation of the Arab world, and I really hope you don’t take the likes of Reza Aslan to have any grasp of the reality of Arab states and cultures. On social media, the people one encounters are among the more educated and privileged individuals in their respective societies (I’ll leave your imagination to guess what the rest are like). Those people on Twitter are privileged enough to have some education enough to be literate. They are people who have enough money to purchase devices and internet services to allow them access to social media. They have access to Western media, Youtube, Twitter, Facebook, or even Netflix, which allows them exposure o enlightenment values and products. Yet you would be hard pressed to find support for a hashtag such as the one presented in this post. Finally, those who travel to the Middle East or Arab countries often visit the most developed and “liberal” cities or tourist locations, which are not representative of what the Arab world is really like. Visiting Dubai, Beirut, or Petra is by no means a fair representation of Arab culture on a large scale. Try visiting Ma’an in southern Jordan or the deserts of Saudi Arabia. Try visiting public schools or even university campuses. Of course, you will find lovely individuals, but the cultures will most likely be not-so-lovely. You will most likely have an easier time finding people like Anjem Choudary than Maajid Nawaz in the Arab world, even in the most developed cities or university campuses. I would be happy to discuss your perceptions against my claims further and if you’re interested in a discussion. Best, most comprehensive and accurate summary I have come across. Thank you for that. I do believe I’m going to call this out as a strawman here. It’s important to recognize the extremist elements within any religion, and that Islam has more than its share. Failing to do so is stupidity at its worst – Wahabism is one of the greatest threats to world peace, and is certainly not a sect of peace. However, failing to put it into context is also foolish. Better to attack the real problem – religious fundamentalism, whether Hasidic Judaism, ultra-conservative Christianity, or Wahabist Islam – than to paint all members of the faith with the same brush and alienate the moderates. In summary, no reasonable person states that Islam is always a religion of peace. However, it is also not reasonable to assert that all Muslims, or even the religion in general, are necessarily a threat to world peace. The problem, as always, are those that interpret a holy book strictly, militantly, and with hostility. It just doesn’t matter which holy book it is. I’m not sure what you read, but the generalisations you speak of are not present anywhere in this article. 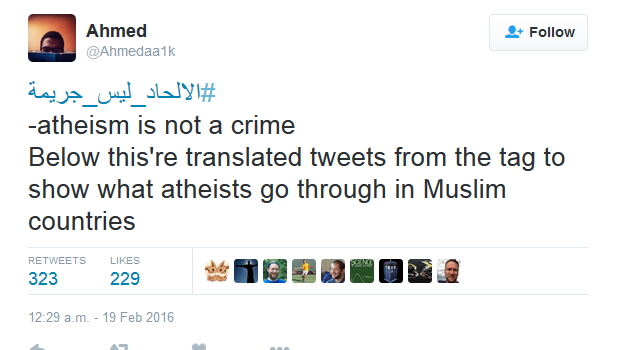 I’m also not sure how it can be a straw man if I claim there are some bad tweets about atheists in Arabic, then go on to provide you with a large selection of bad tweets about atheists in Arabic. There is no straw man here, other than that being put up by Samuel, who is presenting a false equivalency. 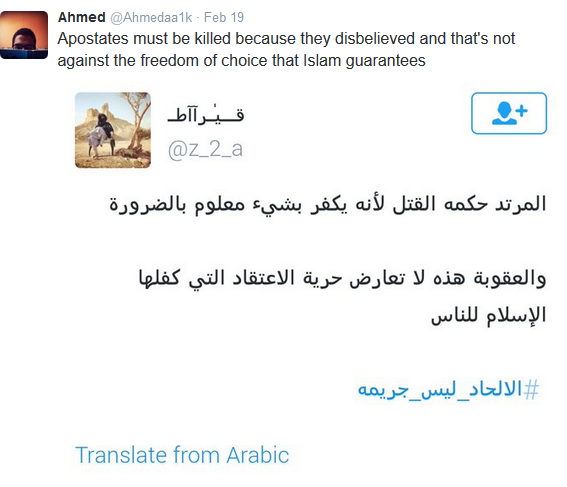 This article is justified in its own terms, namely a selection of the grim things said about apostates by those using Arabic on Twitter. Fair enough. If I were a commissioning editor (I’ve known a fair few) I would be tempted to say “yes, but so what?” There’s no context, just a sort of inverted beauty parade. How many responses did the hashtag gain overall? How many were positive? What were the common themes? What do we know now that we didn’t before? The idea is a very good one, but I fear without that extra layer of context and narrative it can be used by the political Right to say “look, they’re barbarians” and regressives to say “but you’re being too general” with both feeling the article backs that position. I’ve seen there’s been a bit of the latter on Twitter. I agree that a deeper analysis would be good for providing context and giving a more objective understanding and a more reasonable approach to narrative. However, I question whether or not that would be useful or enlightening in a meaningful sense. A quick look over the hashtag shows that there is, in fact, support for the hashtag, including from Arabs, and that is encouraging. 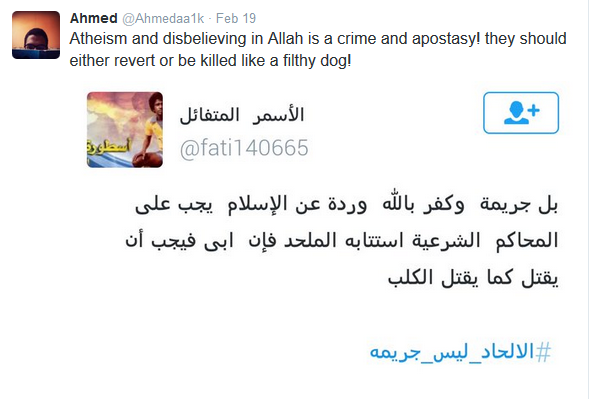 However, these examples of calling for the death of apostates still exist and are held with conviction. But if we were to be critical in our understanding of the general situation, we cannot use Twitter for that. In my previous post (above) I argue that the Arab Twitter user base cannot be a representative sample of the Arab world, and indeed, not even statistically significant. A quick look at user and population numbers shows how insignificant the percentage of Arab Twitter users is: under 6 million users from a population of over 350 million, which is less than 2%. Providing context for such a small demographic is in no way representative of the predominant cultures in Arab states, especially when one considers that not all users are active and not all chose to participate in this hashtag. 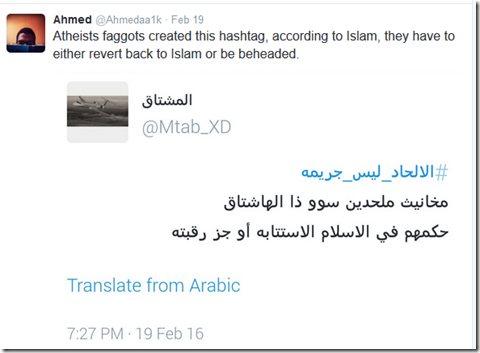 Some users might be unaware of the hashtag and some might have chosen not to participate. This logically makes the 2% (which might have been a high enough number) dwindle into insignificance if we’re discussing general cultural norms. I claim that trying to formulate an objective understanding cannot be done through social media alone. This article is a representation of a niche demographic on a single platform. It reflects the attitude of those individuals, and sadly, these views are pervasive in the Arab world if you ever experience living there and immerse yourself in the culture. I fully support the efforts for developing a much better understanding of context and numbers. However, this seems like a nearly impossible task. One cannot hook enough people, who would be a random and representative sample of Arabs, to MRI machines to find out their true attitudes. One cannot even assume that there would be a safe environment for the sample to express their beliefs honestly in a questionnaire or an interview. One cannot assume that researchers and statisticians would be safe in conducting their research. As for the currently available statistics, be it from Arab governments or the US, it is very difficult to find them to be anything but excruciatingly inaccurate. For example, literacy rates of higher than 95% in countries I’ve been to and lived in are just impossible to believe; it is like Bashar Al-Assad winning 88.7 of the Syrian votes in 2014 during wartime. These numbers are not dealt with in a scientifically honest manner, and I am pessimistic of the possibility of obtaining fairly accurate numbers.